This process also sets a password for the root account. Be sure to set a strong password for the root account. If you’re bad at picking passwords or you just want the security advantages of randomness, generate one randomly from the command line. With root now enabled, the account can be used freely. It will not appear in the Users & Groups preference pane. 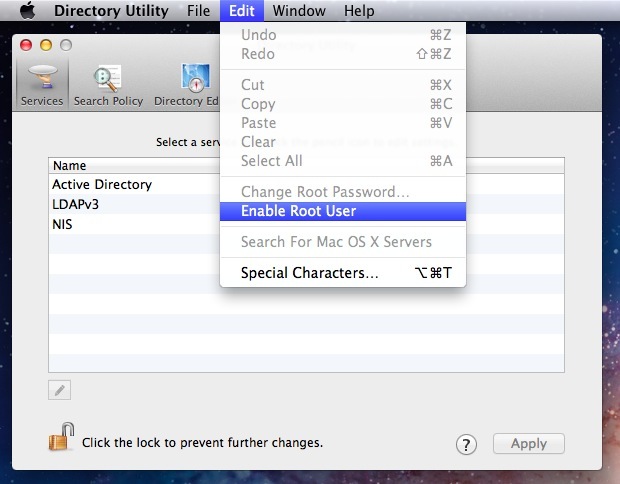 The root account can access, read, and write to all files on a system, even if they belong to someone else. Additionally, root can also remove or replace system files. This is why it’s a potential security risk to leave the account enabled aimlessly, or to use a weak password with the account. The Directory Utility control panel can also be used to change a set root password through the Edit menu, or that can be done through the command line using sudo passwd, similar to changing the root password in iOS devices.